Testing a boat on a choppy seaway can often make it difficult to get a feel for its balance - to find out how she really runs. So when Lindsay Wright tested Sea Nymph's latest model - the 580 Regal - he opted to go sweet 'n' sour. The sour came first; launching straight into the Tasman Sea from Manu Bay, southwest of Raglan. Surfers rode the big westerly rollers as they swept past the point and seconds later the same waves surged over the rocky breakwater near the launching ramp, to crumple on the cliffbound shore. "It'll like this," predicted Sea Nymph managing director, Robbie Hopper, squinting out to sea. 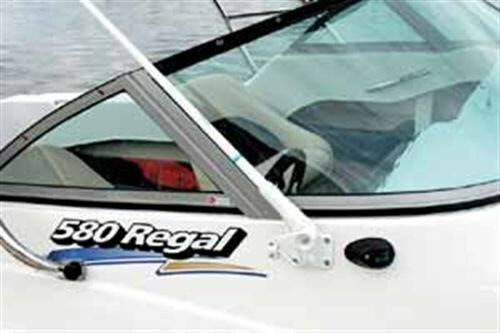 The 580 Regal is a re-designed replacement for the company's highly successful 566 model. 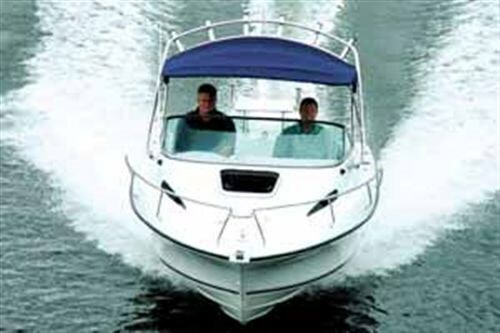 The 566 won best boat at the 1995 Auckland Boat Show, and became the classic Kiwi family boat. Its replacement measures 5.8m LOA, with a small sprit to keep the anchor from attacking the gelcoat on the bow. "We found that people wanted a better family boat than the 566 - one with a smaller cabin but more deck space for all the kids and water toys," says Hopper. "We've also refined a few things - the 580 Regal has twin walk through doors in the transom with lift out inserts…but there's still room to seat four people in the cabin with full headroom." A Weaver deck hatch and acrylic windows provide light and ventilation for that area. At sea, the 1170kg boat proved her mettle; cleaving cleanly over the near vertical wave faces. 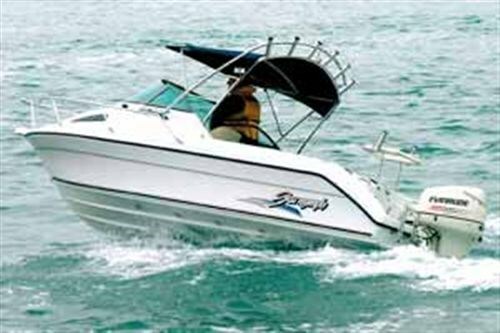 Powered by a 115 horsepower direct injection Salt Water series Evinrude, she had power to spare on the uphill side and the steep 20 degree vee hull sections let us down gently on the backside of the waves. "The boat's designed for power packages from 70 to 150 horsepower - somewhere in the middle of that gives you good performance and economy," says Hopper. Soaring over the big swells with three people aboard, the 580 Regal cruised easily at 30mph (34.5 knots/64 km/h) at 4200rpm and turned comfortably at speed without any of the roll out, hanky panky or cavitation exhibited by some boats I've tested. We were impressed by the quietness and soft ride, caused in part by the boat's steep vee, but also helped by the floor which is made from 18mm plywood, fibreglassed either side, then glassed to wooden bearers and covered with Nautilex or marine carpet. The 580 also has a generous 2.38m beam, which is carried well forward for extra buoyancy. 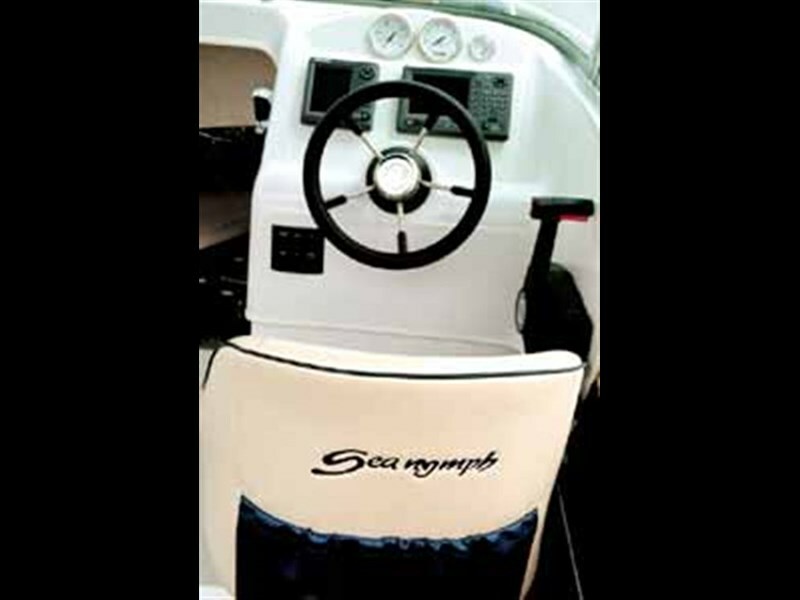 Other contributors to ride quality are the Sea Nymph's special swivel bucket seats. Hopper owns the mould for the seats and has them manufactured by Tuff Plastics Ltd in Rotorua. From there they are upholstered especially to suit the boat's colour scheme. 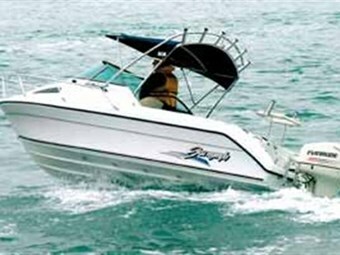 Sea Nymph is about the most experienced boating brand built in New Zealand, covering 40 years of constant production. Many models from the early 1970's are still out there doing it and new ones take to the water at the rate of about 80 a year. Hopper bought the company two years ago and brought a lifetime of boating experience, from sailing dinghies through to jets and ski boats, to the outfit. "I owned a 14' 6" Sea Nymph for years. Great boat - I used to visit the Sea Nymph yard in Tauranga on my lunch hours and admire the new boats." When the company came on the market, Hopper made his move and it took him only three days to sign up and buy the Sea Nymph legend. "I'd never built a boat before in my life," he admits, "and didn't really have a clue where to start." Another Tauranga company, Steadecraft Boats, had a spacious, well-equipped factory and experienced staff that were under-utilised - "so I put it to them that they should start building Sea Nymph boats." Steadecraft jumped at the opportunity to add another line of high quality boats to its output and the resulting arrangement works well for both parties. "I'm looking at doing the same thing with other Sea Nymph models - getting people to build them in Christchurch - or Auckland," says Hopper. "It means I can concentrate on marketing the boats and keeping tabs on the market to find out what people really want." All Sea Nymph builders have to meet strict quality control criteria. And the company isn't resting on the laurels of its well-established family of skiing and fishing models either: another new vessel - a 7m RIB specialist dive tender - will be launched at the Auckland Boat Show in June and is a total departure from the company's other 23 models. Steadecraft's quality build is evident in the 580 Regal. The hull varies in thickness from six millimeters down to a maximum 14mm at the keel and is built to a laminate designed by High Modulus for strength and durability. Each hull carries a five-year structural hull warranty. The test boat comes equipped with a sturdy bimini frame, built by Waikato Stainless Steel, which packs a rack of six rocket launchers for the fisherfolk. The bimini is hinged, and by undoing a couple of thumbscrews, can be lowered for garaging or when headroom gets a bit tight. Three extra rod holders are set into the gunwale on either side of the cockpit. Hopper's on-the-water experience shows in the 580 too. Stainless steel mooring cleats and grab rails are all recessed, edges are all rounded and finish is to a high standard. The tinted acrylic windscreen does its job well, whether sitting or standing, without any annoying blind spots. One small grumble is the panel beside the skipper's seat that holds the 580's Bombardier throttle control. It needs extra fastening and vibrates slightly at speed. The 580 Regal carries 100 litres of fuel in a stainless steel tank that is mounted underfloor and feeds through a filter to the motor. Hopper says that, on a recent weekend, he spent six and a half hours towing family and friends around Lake Karapiro on a biscuit with the 115 horsepower Evinrude, and it cost him $40 in fuel. After a bumpy landing on the standard Voyager trailer at the wave-swept Manu Bay launching ramp, the terylene road cover is clipped on to the 580 and Hopper drives at speed to Lake Karapiro for the sweet component of the test. With an all up weight of about 1300kg the boat tucks easily in behind a family car or 4WD. In the calm water of the lake, we get to really wring the 580 out. The boat's hull strakes end about 60 percent of the distance from her bow, giving a smooth flat run on that aft part of the hull which has all the water contact at speed. The 580 lifts easily out of the hole on to an effortless plane and, by progressively reducing the engine revs to 2400, it's possible to hold her just sitting on the plane at about 10 knots - trolling speed. At the other end of the rev range, the little green numbers of the Furuno 1650W GPS speed readout show 45.4mph (39.6kts/ 84.3km/h) at 5200rpm, feeling safe, stable and light on the Teleflex Morse cable steering the whole time. A Furuno LS4100 sounder keeps an eye on water depth. The 580's hull also continues back beyond the engine mounts, giving her ample buoyancy and stability at the stern with a bonus huge storage area inside the hull. "It's perfect for dive bottles back there - one of our dealers puts foam racks in there for bottles - they'll carry any amount of weight back here," Hopper says. It also makes the 580 sit level at rest. The battery and two stroke oil tank are securely stowed under the cockpit coaming forward of the engine. Storage isn't an issue on the 580. It starts forward with small bins under the cabin squabs, there's a large stowage area under the cockpit floor, more bins under the seats and a ski-sized shelf around the edge of the cockpit. The hull is lined with pale grey Frontrunner carpet. Getting out on the water in the 580 Regal, as tested, will set you back $57,990. A basic boat packing 90 horsepower on the stern costs $39,900 and hull only packages go for $23,990. That money buys a boat which revels in the sweet and the sour with safety and comfort.